It can be tempting to try and cook the food for your private event such as a birthday or graduation party. It is a noble desire to want to cook for your loved ones at this special event, but even the best home cooks can run into trouble when taking on this kind of challenge. • Proper Equipment. Chaffing dishes, water pitchers, serving trays, and more are all needed to properly cater an event – equipment that most people just don’t have. • Experience in cooking on a large scale. While you certainly have many delicious recipes that you have made countless times for your family, it takes experience and knowledge to scale those recipes up to serve a large group successfully. • Time to enjoy the party! By leaving the cooking to the caterer, you can enjoy the event and not spend your day sweating it out in the kitchen. 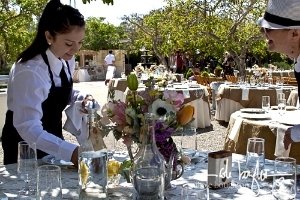 Popolo Catering has been serving the great people of San Luis Obispo for more than 25 years, and we will bring all of our experience to make sure you have a memorable private event. We look forward to serving you soon! I’d like to share one of my favorite recipes Tuscan Style Roast Pork with you. Click here to download the recipe.